These powerful stories were written by youth from foster care who wanted their voices heard and their stories remembered. The origins of this book came from conversations with a probation youth who had spent over 14 years of her life in the foster care system. Casa Pacifica Centers for Children and Families, a residential treatment center and shelter home for abused and neglected children in Ventura County was her 24th placement, and she was struggling to find a foster home. This book was created and published in 2011 by the California Youth Connection (CYC). CYC is a statewide non-profit organization comprised of current and former foster youth dedicated to working with policy makers and the community to improve the foster care system. CYC empowers youth to use their voice to create positive changes in their lives and improve the circumstances for children in care. For the youth involved with CYC, it is more than an advocacy organization; CYC provides a positive environment where there is mutual respect, acceptance, love and support among all members. It is the family we never had. 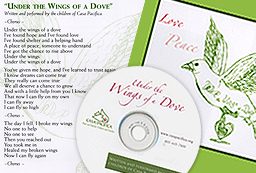 At the request of Casa Pacifica’s administration, several of the students involved in the music program, collaborated together and under the direction of Jill Ball and Tom Ball, wrote a song for the Casa Pacifica web site called “Under the Wings of a Dove.” Based on the Casa Pacifica logo and mission, the children focused on conveying the important role that Casa has played in their lives, as well as the hope it fosters in each of them.